- Spread butter on 1 side of each piece of bread. - Spread mayo on non-buttered side of 1/2 the pieces of bread. 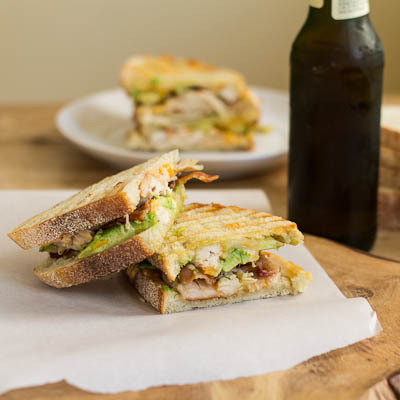 - On remaining pieces of bread, evenly distribute cheese, chicken, bacon, and avocado. (Cheese should be the first thing you put on the bread so it will melt easily. - Place mayo coated slices on top, buttered side up. - If using a grill pan, place a heavy pan on top and cook 2-3 minutes per side, until golden brown. Alternately, cook in a panini grill until desired degree of doneness.